MAVEN at Mars, where it may yield the secret of what happened to the planet’s air and water. 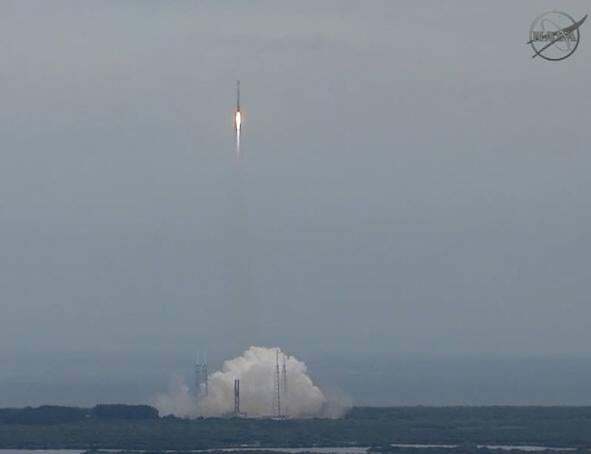 At 18:28 UTC (1:28 p.m. Eastern US time) today, the Mars Atmosphere and Volatile EvolutioN spacecraft — MAVEN — is set to launch into space, headed for the red planet. It is sitting atop an Atlas V rocket, and all systems are go. It will be livestreamed on NASA TV (and I assume their USTREAM channel) and I’ll live tweet it as well. After launch, MAVEN will take ten months to get to Mars, arriving in September 2014. Once there, it will go into orbit, test itself out, then begin operations. It’s one-year mission: to help us understand why Mars lost most of its atmosphere long ago. We have lots of evidence that Mars once had liquid water on its surface. Some of it was from floods, but it also had standing water, including lakes and perhaps oceans. That means it must have had a thicker atmosphere millions or billions or years ago. It doesn’t now; the pressure at the surface is less than 1% of Earth’s. Where did it go? One hypothesis is that the solar wind — the constant stream of particles blown out by the Sun — stripped Mars of its air. The Earth has a strong magnetic field that acts a bit like a force field from Star Trek, rebuffing most of the particles sent our way, protecting our air. Mars lacks such a field, and given time this may have caused its atmosphere to erode away. 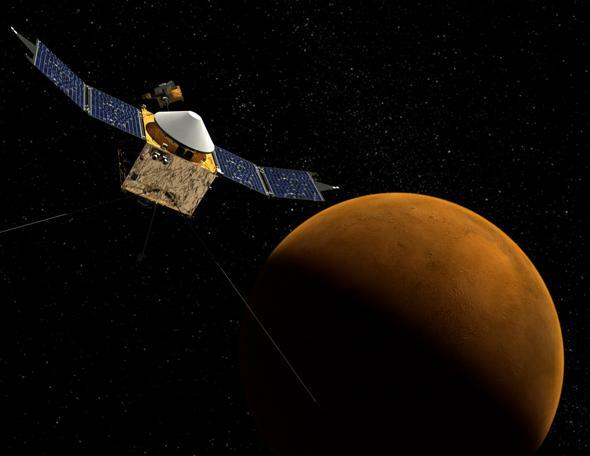 MAVEN will use its suite of eight instruments to examine the upper atmosphere of Mars and investigate the interaction between the gas there and the Sun. Scientists will examine these data to look for clues on the missing Martian atmosphere… and for that matter, try to figure out where all the water went as well. NASA also has a fine overview of the mission on their site, and as always with all things planetary, keep an eye on Emily Lakdawalla’s blog at the Planetary Society, and follow her on Twitter. She always has the scoop. I’d be remiss not to mention that the top banana, the head cheese, the big dog, the principal investigator of MAVEN is Bruce Jakosky at the University of Colorado right here in my hometown of Boulder. Why bring that up? Well, hometown pride, of course. But also, just a not-so-gentle reminder: What happens on Mars quite literally starts right here on Earth. 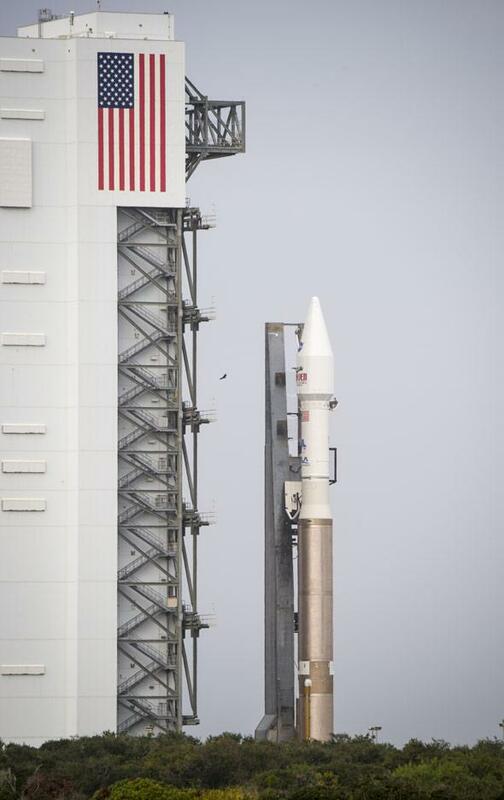 A journey of a hundred million kilometers begins with a single step: MAVEN on the pad, awaiting launch.